Do you have a documented social media marketing strategy with clear business goals in place? If you’re not sure, you suffer from social media blindspots. As a result your social media marketing team reactively responds to fire drill after fire drill. 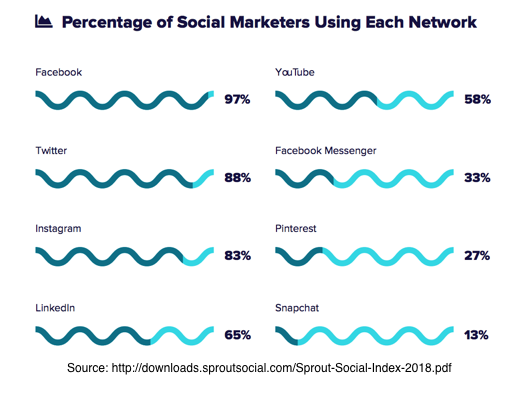 2018 social media research from Sprout Social underscores the contradiction between social media marketing activities and business objectives. 4 out of 5 of social media marketers focus on awareness building and 2 out 3 care about engaging their community. While important for branding, neither activity yields directly measurable results. So it’s no surprise that over half of social media marketers can’t measure ROI. 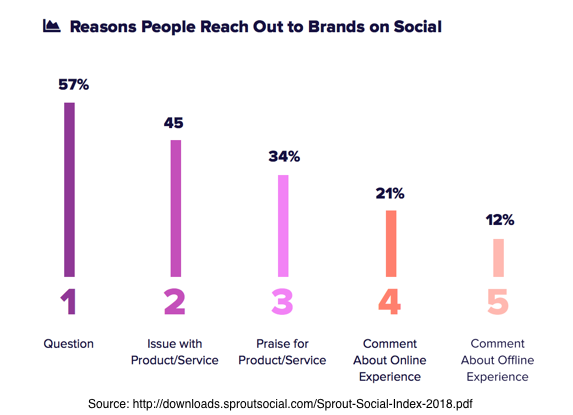 To do so, they need to encourage social media audiences to take actions that are measurable through the use of tracking codes, calls-to-action, and landing pages. 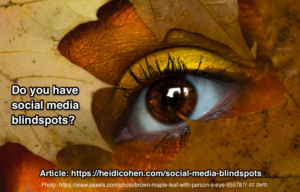 To remove your social media blindspots let’s examine how to align your social media marketing with your business goals. On social media marketers focus on building awareness and engaging with participants. Expand your audience. Use platforms’ depth of participant information to learn about your audience. 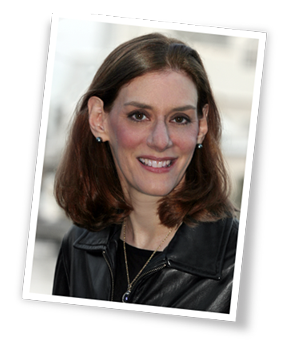 Then apply this information to create and track look-alike audiences. Answer and qualify potential sales. To enter their consideration set be present where your prospects gather purchase information and/or inspiration. YouTube and Pinterest support purchase-related activity. Improve your marketing. Use social media advertising to cost-effectively segment, A/B test, and improve your marketing. 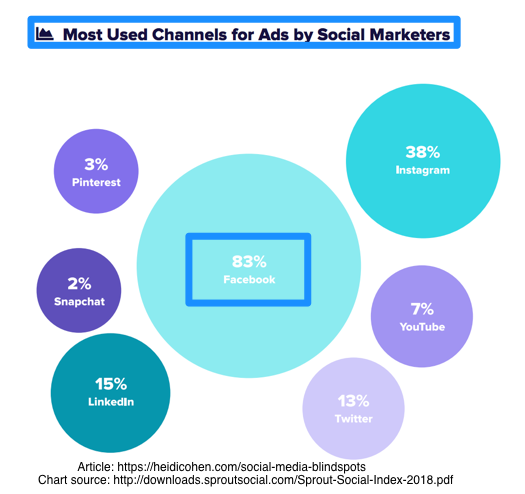 Use social media advertising to support organic search. Facebook continues to dominate marketing budgets. Send visitors to your website from social media. Establish your presence on networks to establish your brand and drive traffic. Build influencer relationships. Follow and engage with key influencers on social media. Support search. Include YouTube and Pinterest as visual search platforms. Provide customer service. 88% of businesses use social media to respond to customer issues and 45% of customers reach out on social media. Gather competitive information. Use tools to monitor your brand, keywords and competitors. 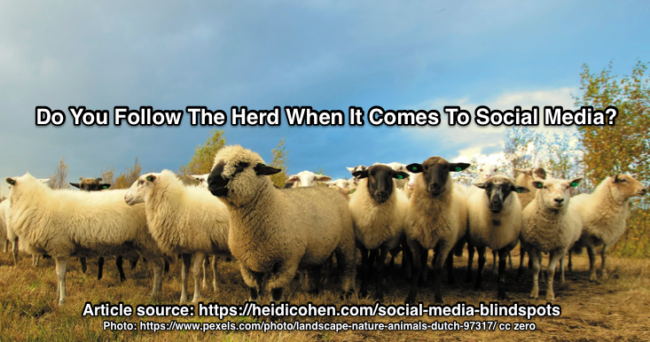 Do you follow the social media herd? 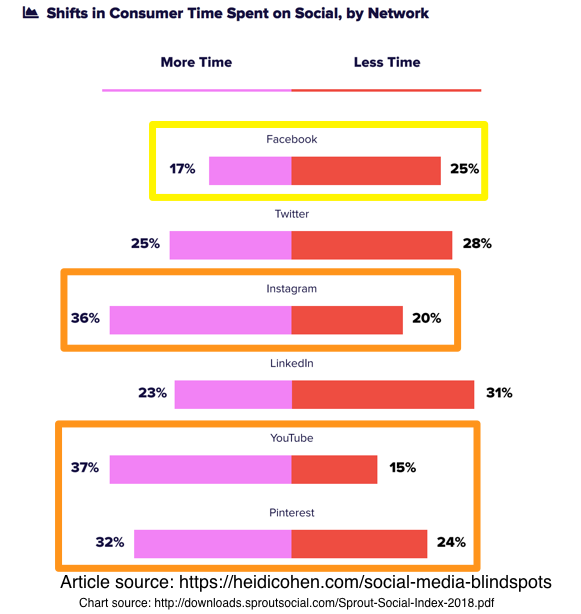 By contrast, here’s how consumers use social media. YouTube and Pinterest are underserved opportunities. More importantly they act as visual search engines. 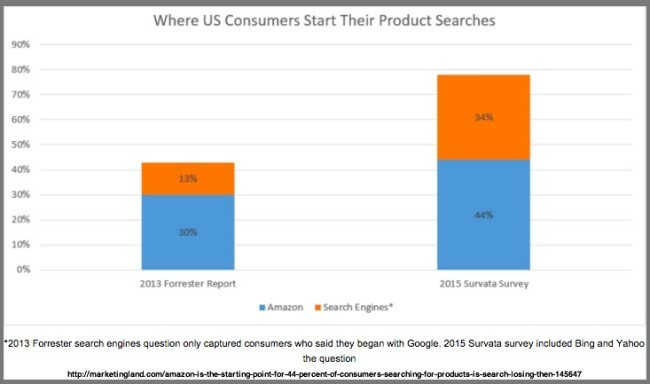 After Google, YouTube is the second largest search platform. Don’t let Pinterest’s reputation as a female dominant platform deter you. Participate on secondary networks (like Reddit). 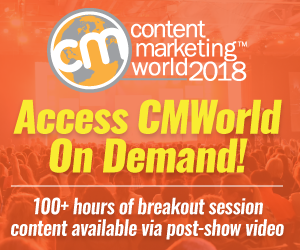 Stay abreast of current trends and build relationships to amplify mega-content. Actively participate on relevant rating and review sites (like TripAdvisor and Amazon). Respond to both positive and negative input. Support existing communities related to your business. (Includes Facebook and LinkedIn Groups and targeted platforms like Spiceworks and Ravelry). Contribute and pay-it-forward where peers and customers spend time. Monitor question and answer sites (like Quora). Answer relevant questions to attract earned media. Leverage closed communications platforms (like Slack). This gets messages across groups and businesses. Of course, have documented social media guidelines. 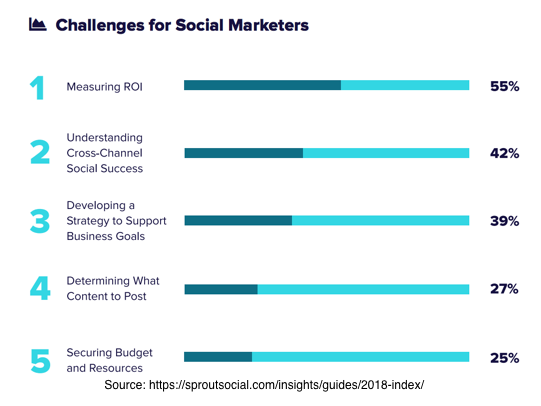 While marketers say that their top social media obstacle is measuring ROI, they have related problems that hold them back from achieving their goals. 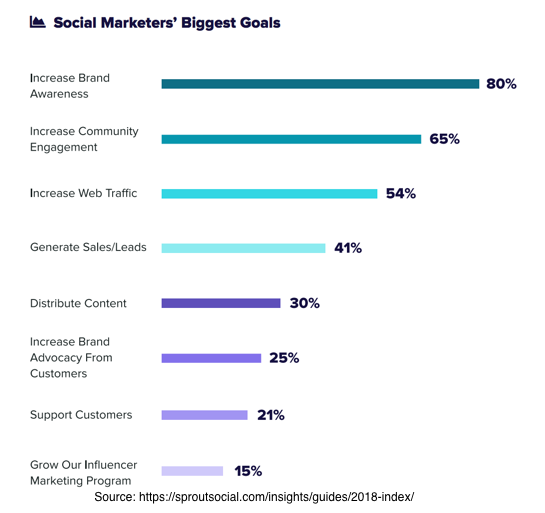 To generate measurable social media results, you need a documented social media strategy focused on achieving your key business goals. Further, it must be aligned with your overall marketing including content marketing and cross channel utilization. As part of this plan, you must be able to track prospect action across various platforms. 55% are challenged to measure ROI. 42% are challenged to understand cross-channel success. 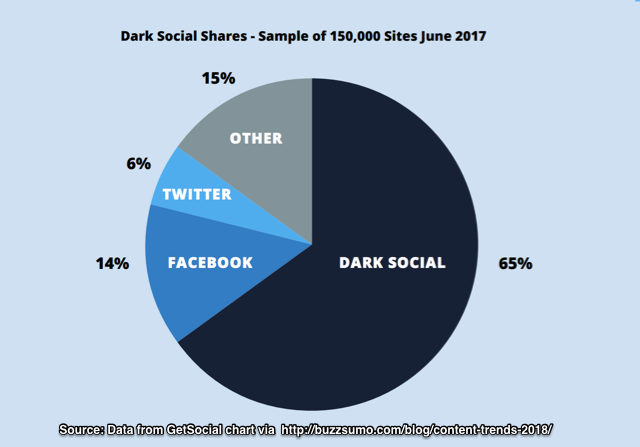 39% are challenged to document a social media strategy. 27% are challenged to determine what content to post. 25% are challenged to secure budget and resources. Assess the fully loaded cost of social media investment including staff, software, content and outside resources. Track results that yield sales or savings. Develop a social media strategy. Include individual channel plans for each network to ensure that your content and communications are tailored to the social media platform. Create and document your content marketing strategy. Get input from across your organization to check that your content and communications are branded and consistent. Incorporate tracking into each piece of content or communications shared on social media. This is key to being able to measure results across platforms. Social Media Blindspots occur because you lack a documented social media marketing strategy. As a result, your social media marketing isn’t aligned with your business goals. Even worse, you’re probably not tracking the right metrics so that you’re left with whatever results were captured. Take a deep breath since you can handle this. Gather the social media schedules, plans and content that you’re currently using as well as any information you have regarding your prospects and social media usage. Analyze it and compare it to the research to see where you have opportunities. Check related marketing plans such as marketing overall and content marketing. Get input from other areas of your business regarding their content and social media needs and plans. Include sales, customer service, product, technology (including website), HR and management. Start to test and measure your new social media approach. Go on—the sooner you start, the sooner you will start to generate results. Tags Sprout Social. Bookmark the permalink.